This beautiful corner entertainment center - built and finished by hand from solid American wood - is the ideal way to incorporate your family's entertainment needs into the living room without sacrificing precious wall space. With a timeless Mission-style look and customizable storage options versatile enough to meet any need, the McCoy is a piece of furniture that promises to be just as much a part of your family's story twenty years from now as it does today. Every piece of the McCoy is crafted to your specifications by dedicated Amish woodworkers in the northern United States who bring nothing but the best in home-grown quality to the pieces that they create. They sand each surface by hand for an incredible, perfectly smooth finish that machine-finished surfaces just can't hope to imitate; every last inch is inspected by a master craftsman, ensuring that your McCoy meets the highest standards of quality. 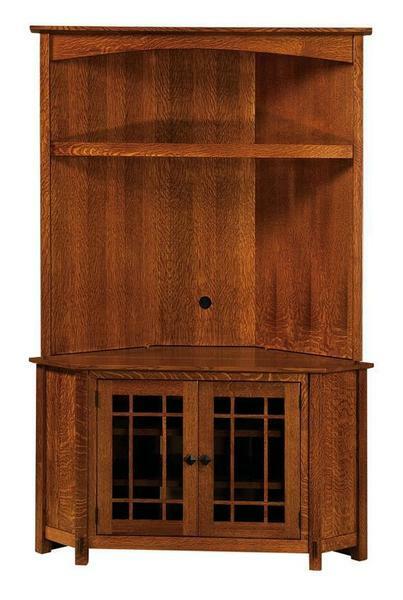 The menus above list all of the options available on this beautiful corner entertainment center. If you run into any questions - or if you'd like to discuss having our woodworkers craft a completely custom piece - please reach out to us by phone or by email. We would love to be a part of your story.